A photo ebook about how tight are the spaces in Tokyo. About 13 years ago I worked for a brief period as an assistant in a firm of architects, and I have designed the new house of my parents, therefore I know how much the rules are strict and several in European constructions. 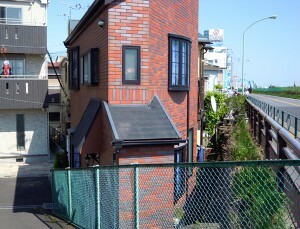 I was surprised the first time I ever saw the houses in Tokyo, narrow and collected adjacent to one another, with a few inches of space to each other! In Japan the Right to property exceed the urban safety regulations, and is not uncommon to see residents who train by themselves to get ready to take action in case of fire, which flares up between these tight spaces very quickly, where neither firefighters nor ambulance can reach. Impossible design or optical illusion? Here in Tokyo the cost of land is among the most highest in the world, so the space is quite valuable. But is in the use of this space that we see the originality and sometimes the creativity of Tokyo!